Testa Center provides high-quality lab environments for upscaling of various biological processes. 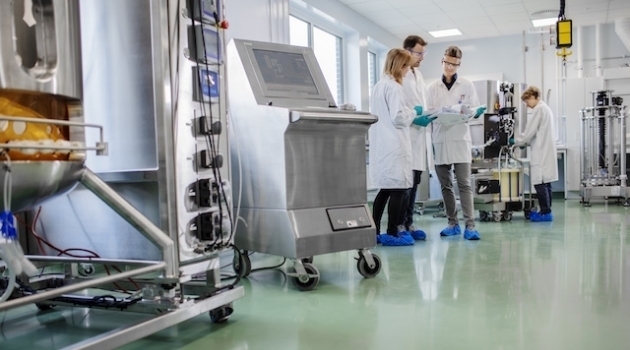 Uppsala University and GE Healthcare Life Sciences have signed a long-term collaboration agreement that gives university researchers the opportunity to test biological processes on a large scale and students important experience with industrial processes in the newly opened Testa Center in Uppsala. “By gaining access to Testa Center’s authentic environment, the University will be able to develop completely new training courses focusing on large-scale production of biopharmaceuticals and bioprocesses. The center also offers researchers excellent opportunities to test processes on a large scale, shortening the path between discovery and benefits for society,” says Deputy Vice-Chancellor Anders Malmberg. Testa Center is a facility funded in part by Vinnova, Sweden’s innovation agency, which has recently been inaugurated at GE Health Care in Uppsala. The center provides high-quality lab environments for upscaling of various biological processes. “The center is an example of successful collaboration among the public and private sectors that brings together many important organisations in Sweden. The enthusiasm has been amazing, and I believe many innovations will be brought to the market through Testa Center,” says Lotta Ljunqvist, Managing Director of GE Norden and of Testa Center. For the University, the agreement means that researchers and students gain access to equipment, specialised expertise and skills from third-parties that cannot be offered in the University’s own premises. It will be an exciting environment in which to work, interacting with entrepreneurs and companies. “Through this collaboration, we can use Testa Center as a base and help Sweden maintain a leading position in biological processes and the production of biopharmaceuticals,” says Anders Malmberg.